1. Ez of Creature Comforts (and a personal fave) has a wonderfully curated collection of goodies over at DaWanda. 2. Keith emailed me about this really awesome thing they're doing over at fredflare.com. 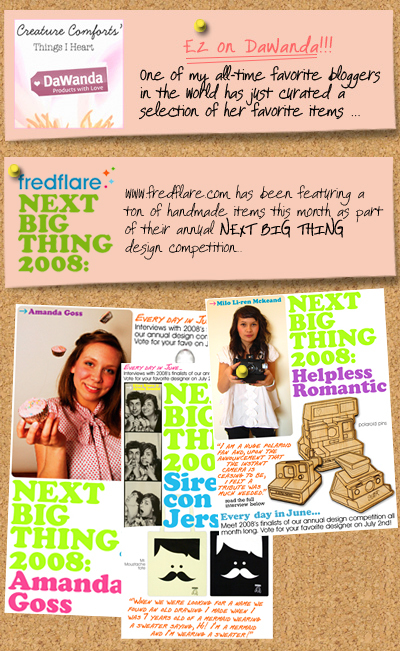 They've been featuring a top-notch collection of handmade items this month, as part of their annual NEXT BIG THING design competition... They do a yearly call for entries and get a handful of amazing submissions of items made by their customers!They've been featuring a new interview with one of the 27 finalists everyday at www.fredflare.com/blog. Then in July the fan fave wins $1000! Many of the designers are brand-new and have never shown their work before - go on, check it out! Pitter pat, pitter pat! The sound of my heart all a flutter! You know this is SO up my alley! Thank you for sharing this Marichelle! You're the sweetest Marichelle! Thank you so much! you're SO welcome!! Loved all your picks!